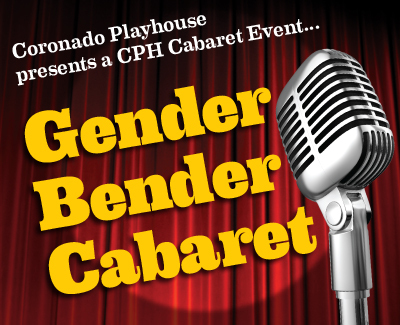 Gender Bender Cabaret Community Cabarets and Concerts Series April 3, 2016 One Night Only! 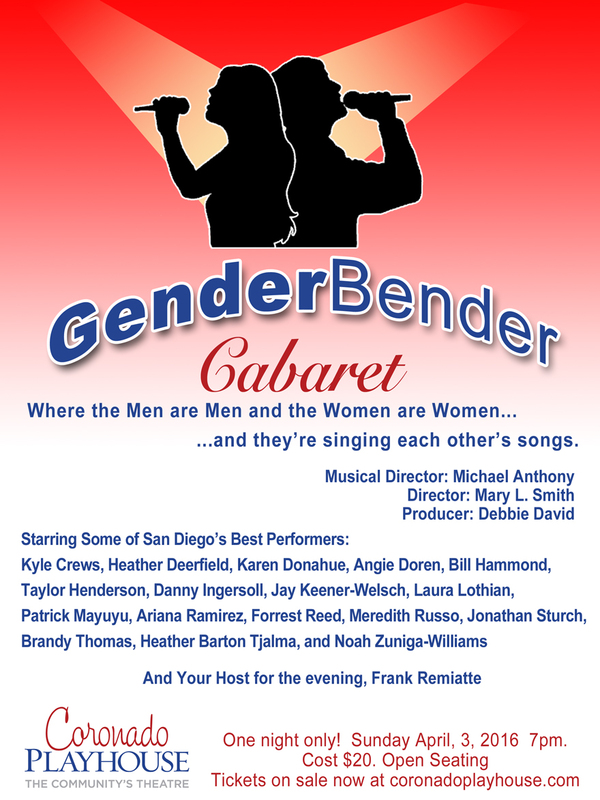 San Diego’s premier performers are singing each other’s songs this Sunday April 3, 2016 at 7 p.m. in a Gender Bender Community Cabaret, part of our Cabaret and Concert Series. In this one night only event, the women sing male songs and the men sing female songs. This exciting and rare performance will not be a drag, just pure entertainment. Coronado Playhouse is the longest running community theatre in San Diego County and Coronado’s oldest arts organization. The 2016 season marks 70 years of entertainment, service and outreach to Coronado and Southern California audiences. The rundown of music with a twist includes hit songs from Cabaret, Wicked, Les Miserables, A Chorus Line, Rent and many more Broadway and contemporary favorites. The host is Frank Remiatte and the talented cast includes Danny Ingersoll, Laura Lothian, Frank Remiatte, Heather Deerfield, Jay Keener-Welsh, Karen Donahue, Jonathan Sturch, Bill Hammond, Ariana Ramirez, Patrick Mayuyu, Brandon Thomas, Noah Zuniga-Williams, Heather Barton-Tjalma, Forrest Reed, Angie Doren, Taylor Henderson and Kyle Crews. The award winning production team includes director Mary L. Smith, musical director Michael Anthony and producer Debbie David. 619-435-4856 or go to our website, www.coronadoplayhouse.com.